Throughout April, the students of 20 schools of Florence and its province offer free guided visits to 19 culture places in the city and its territory. 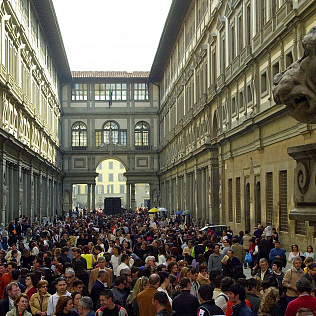 Among the museums, of course, there is the Uffizi Gallery. Students will be \"ambassadors of Art\": this is the title of the initiative, which expands from a project that started in 2004. Over the years, the number of school classes who have joined has grown steadily. The visits will be free, and \"ambassadors\" will lead them in Italian and other European Union languages. Students involved are more than 1000. This is an important opportunity for them to fully understand the importance and significance of the historical and artistic Italian heritage. Young people, with this initiative, are directly involved in its preservation and dissemination. Students of the Institute \"Leonardo da Vinci\" in Florence will take care also to capture the most significant moments of this month, through photographs and video footage.